Our products have earned rave reviews from professionals to entrepreneurs. See what they say about our products below. You are welcome to submit your review on our products too! Day 1 : I can sleep longer and deeper, 3-5 hours ; feel fresh after wake up. Day 2 : I can sleep straight 5 hours and wake up awhile and continue sleep 2 more hours until morning. Before consuming your tea, I only can sleep 2 hours (even though I sleep at 7-8pm because too tired of sleepless nights for a few months). I will automatically wake up then can’t sleep anymore until next day morning. Thank you for your (Rhymba Hills®) Lemongrass Blend tea for helping me with my sleep issues!!! ? After drinking Rhymba Hill’s Lemon Grass Tea, I feel so much lighter as it has a mild laxative effect for regular defecation and cleansing. Now I do not feel so tired and have more energy for my favourite activities. Also, Misai Kucing Tea helps me with my digestion after a heavy meal. After drinking Rhymba Hill’s Lemon Grass Tea, I managed to move my bowel more regularly. Also my complexion is now smoother. A cup of Rhymba Hill’s Misai Kucing Tea every night, helps me feel more relaxed after a tired day. I tried Rhymba Hill’s Lemon Grass Tea and Misai Kucing Tea for the first time and had immediate effect. I always have wind in my stomach and after drinking Lemon Grass Tea, I started to expel the gas. Misai Kucing helped me to get rid of my constipation in almost 24 hours. The next morning, I could move by bowel with ease. The Misai Kucing Tea you gave me that day. A good friend of mine was migrating to US and she has serious gout issues. So I gave it to her first…and she messaged me from US. 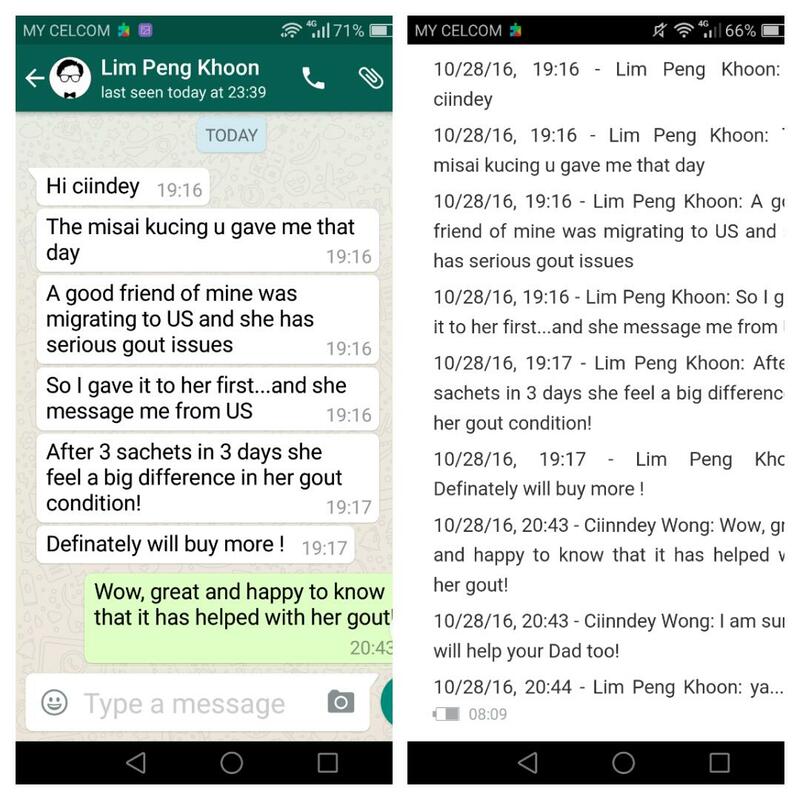 After 3 sachets in 3 days, she felt a big difference in her gout condition!